The latest and dizzying advances in genetic engineering and the emergence of a new and revolutionary discipline—plant nanobionics—means that a future is just around the corner in which plant species are custom-designed in the laboratory. The motivation for researchers is not just to maximise their nutritional properties or their adaptability and resistance to different environments and climatic conditions. Plants are also capable of developing functions and applications that are alien to their nature, such as purifying the environment, illuminating public roads and the interiors of homes, and even detecting explosives and terrorist threats. During the past month of December, researchers from the University of Washington announced their success in the creation, thanks to genetic engineering, of one of these “air-scrubbing” plants. Specifically, it is a genetically modified version of the popular pothos plant, also known as Devil’s Ivy (Epipremnum aureum), that’s capable of eliminating chloroform and benzene (two carcinogenic compounds). The team’s success was achieved after developing a version of an artificial gene that encodes cytochrome P4502E1, a protein that occurs naturally in the liver of mammals and that permits the degradation of the aforementioned compounds. The artificial gene was introduced into the genetic material of the plant so that it was present in the cells of the leaves, and it was found that the new specimens reduced the air concentration of benzene and chloroform by more than 75%. This is only the first step, since the objective is to create a battery of indoor plants capable of eliminating the different pollutants in the air, so that being at home becomes the closest thing to breathing pure air. In fact, they are already working on the introduction of a synthetic gene that encodes a protein that degrades formaldehyde, another usual suspect that is present in a multitude of objects made of wood—from furniture to floor sheeting—and in tobacco smoke. Plant nanobionics is a revolutionary new discipline that is based on the introduction of nanostructures into plants in order to provide them with extra capabilities and functions that don’t occur in nature. The leading exponent of this discipline is the engineering group led by Michael Strano at MIT, which in 2016 managed to develop spinach that could detect the presence of explosive substances in its surroundings. To achieve this, they introduced in the leaves of the plants carbon nanotubes coated with a polymer that binds to compounds usually present in explosives, such as nitroaromatic derivatives. In this way, when one of these compounds reaches the leaves, either through its stomata—the pores through which the leaves “breathe”—or through the roots, it bonds with the polymer and produces a fluorescence that activates an alarm when detected. In addition to explosives, the MIT laboratories have designed nanotubes and polymers capable of detecting a wide variety of dangerous compounds: toxic and poisonous substances such as hydrogen peroxide or sarin gas. One can imagine a not-too-distant future in which hedges or planters located in public spaces—such as squares, airports, subways and train stations—are capable of monitoring and detecting these kinds of threats. Bioluminescence is a process by which some organisms—from bacteria and fungi to fish and fireflies—are able to produce light through a chemical reaction inside their cells. It works by the oxidation of a compound that these organisms produce—luciferin—through the intermediation of a luciferase enzyme. Recently, an international team has managed to identify the three genes that allow these organisms to synthesise luciferin. This science fiction scenario had already been envisaged just a year earlier by MIT engineers, who were able to create plants that emitted light using nanobionics through the introduction of light-emitting nanoparticles in the leaves. Specifically, they created two types of nanoparticles that contained luciferase and luciferin, respectively, and that, once inside the plant, released them to mimic natural bioluminescence. The purpose was to create plants that would act as a source of domestic lighting. As in the tale of Jack and the Beanstalk, a group of American researchers has managed to accelerate the growth of plants. 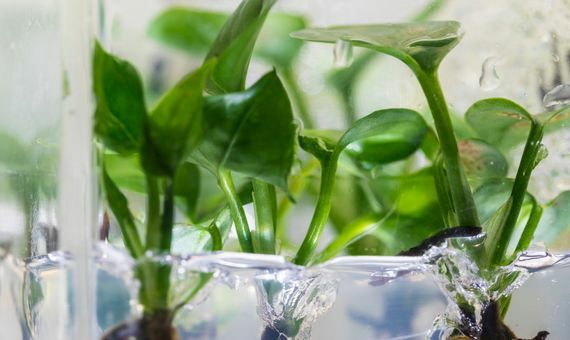 Through the application of genetic engineering, they have designed an “improved” method of photosynthesis that increases the productivity of crops. Although photosynthesis is one of the most incredible and successful processes in nature—it allows plants to grow from a few nutrients and the sun’s energy—it’s not perfect. One of its main limitations is that the enzyme that catalyses the conversion of CO2 (and water) into sugars is not able to distinguish between that molecule and that of oxygen. Consequently, about one in five times it binds to the latter and generates a plant-toxic compound that must be recycled through photorespiration. Like any metabolic process, this requires a consumption of energy and resources that the plant stops investing in photosynthesis. 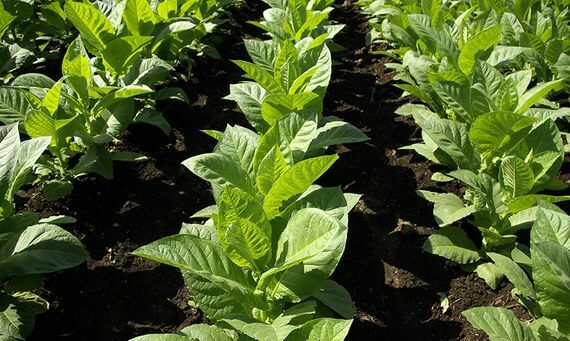 As the authors of the study explain: “We could feed up to 200 million additional people with the calories lost to photorespiration in the Midwestern U.S. each year.” With this mind, the researchers managed to obtain a GM variant of tobacco with an improved photorespiration process that minimises its energy expenditure. This translates into plants that grow up to 40% more than their natural congeners. And now they are trying to transfer this modification to some of the most widespread crops, such as potatoes, soybeans and rice.